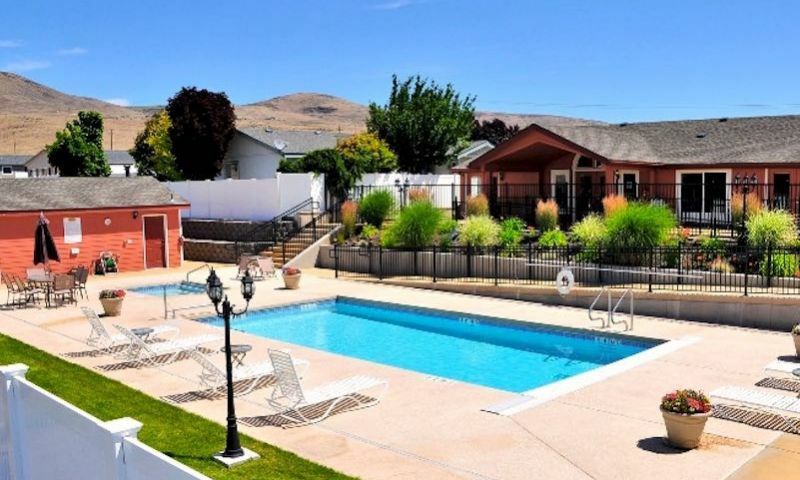 Quail Run at Terrace Heights is a 55+ community in Yakima, Washington. Construction of this community began in 2008 and upon completion it will contain 119 single-family homes. Nestled along the base of Mount Rainier, Quail Run at Terrace Heights provides active adults with plenty of recreational opportunities. Quail Run at Terrace Heights has the amenities, location and reasonably priced homes to please active adults who decide to live in Washington. At the center of the community is the 2,500 square-foot clubhouse. Stay in shape in the exercise room or relax with friends in the entertainment room that is equipped with a billiards table and catering kitchen. The clubhouse also offers a library with card tables for absorbing a great new book or joining a card game with your new neighbors. Outdoors, residents have access to a pool, spa, expansive patio, and barbecue area for making the most out of the warmer months. Quail Run at Terrace Heights also provides homeowners with horseshoe pits and a pet park. You can also say goodbye to expensive storage fees for your R.V. because Quail Run at Terrace Heights provides an R.V. parking lot. Quail Run at Terrace Heights offers residents seven floor plans. Ranging in size from approximately 1,200 to over 2,100 square feet, these seven models are perfect for downsizing. These residences offer two to three bedrooms, two bathrooms, and an attached two or two-and-a-half-car garage. Most homes have a den while all feature single-level living and a private patio. Quail Run at Terrace Heights provides homeowners a low-maintenance lifestyle in the heart of the Yakima Valley's unparalleled beauty. With 300 days of sunshine a year, Quail Run at Terrace Heights is perfectly situated for 55+ homebuyers who want to enjoy the great outdoors. Residents will also have more time to enjoy everything that the community and area has to offer. A monthly fee covers sewer and garbage service, common area maintenance, street cleaning and on-site management, giving residents more time to enjoy the amenities in their community, the company of neighbors, or simply exploring the area. Quail Run at Terrace Heights is located in Yakima, WA. Just three miles from the community's gates are several shopping centers that include Target, Wal-Mart, and a Safeway. Approximately five miles from Quail Run at Terrace Heights is the Yakima Regional Medical Center. Quail Run at Terrace Heights also allows easy access to Interstate 82 and, when your next destination is farther, McAllister Field has daily flights to the Seattle-Tacoma International Airport. Golf lovers will delight in the 18-hole Yakima Country Club golf course that's less than two miles to the south. Yakima Valley is best known for its well-established vineyard scene, giving the wine lover over 11,000 acres of vineyards to explore. Outdoor adventures will never be lacking because Yakima is home to several state parks, a greenway and endless hiking in the surrounding mountains. Active adults and retirees near Yakima, Washington will have something to look forward to everyday while living in Quail Run at Terrace Heights..
Clubhouse - 2,500 Sq. Ft. There are plenty of activities available in Quail Run at Terrace Heights. Here is a sample of some of the clubs, activities and classes offered here. Quail Run at Terrace Heights offers residents seven floor plans. Ranging in size from approximately 1,200 to over 2,100 square feet, these eight models are perfect for downsizing. These residences offer two to three bedrooms, two bathrooms, and an attached two or two-and-a-half-car garage. 55places.com is not affiliated with the developer(s) or homeowners association of Quail Run at Terrace Heights. The information you submit is distributed to a 55places.com Partner Agent, who is a licensed real estate agent. The information regarding Quail Run at Terrace Heights has not been verified or approved by the developer or homeowners association. Please verify all information prior to purchasing. 55places.com is not responsible for any errors regarding the information displayed on this website.